Galahs are also called rose-breasted cockatoos and can be found almost all over Australia. With pretty pink chests and grey coats they strike a stylish figure as they strut about the gum trees. They fly around in pairs and collect in flocks and are extremely social birds. 'Mad as a galah' is a common Aussie saying which probably originated from the fact that they can make loud screechy noises if upset and once they get into this whining state it can take quite a while to calm them down. There was a time when I too thought they were somewhat crazy. Every night when we took our dogs Scotty and Benny for a walk, one particular galah who should have been fast asleep in his tree high above us and in no danger whatsoever from anything around, would start screeching and wake up the whole neighbourhood in the process. But Galahs are far from mad. They are very friendly birds. They love showing you their nests and introducing you to their friends and family. They love posing for photos and call out to us when we are out and about with the camera. A very good friend of ours Brian Taylor who is an expert on the Australian bush and has written several books on the subject recounted one his observations. 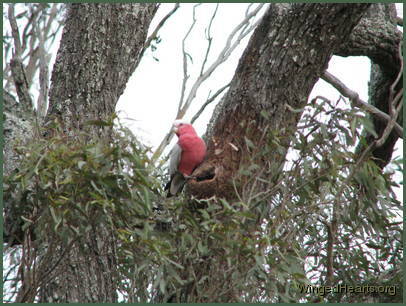 He too thought that galahs were a bit idiosyncratic until one day he witnessed them do something quite remarkable. You see Brian had a made a feeder out of a log which he hung in the patio outside his kitchen window and each day he would sprinkle some seeds for the birds. A galah landed on the log and saw the dish was overflowing with husks. The bird flew off and returned a few moments later with a small leafy branch which he or she proceeded to use like a broom sweeping all the husks out of the dish, cleaning it out thoroughly. The bird knew how to be tidy and create implements to keep the feed bowl clean. During this 30 day blog challenge I am gifting a copy of the 23 Amazing Facts About Wild Bird Culture with true stories - click on this link and enter your details.